c.1982/83? | age 14/15? Poor Blue Leader gets it today: it seems that Darth Vader has joined the fray! In the Marvel adaptation we actually get to see Vader climb into his TIE fighter. But not here—nor in the (ahem) film version of SWa9. No, Vader’s appearance here is very all-of-a-sudden. Maybe a preceding page was lost along the way? 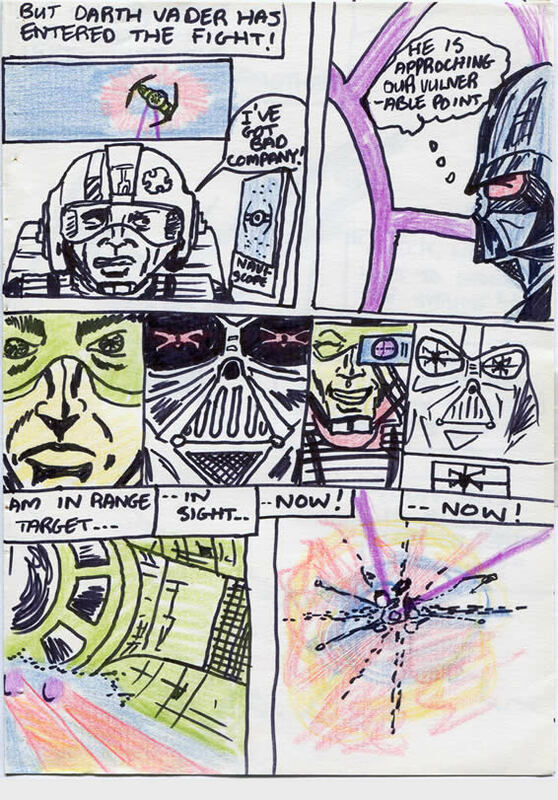 When young Johnny and I were watching bats at dusk, on our summer holiday in West Cork; it suddenly occurred to me that Vader’s modified TIE fighter is somewhat reminiscent of a bat! I don’t know if it was intended by the designer (Joe Johnson?) but I bet it enhanced its visual impact on viewers—subliminally. What do you think yourself? Thanks Neil – poor Blue Leader. I wonder what other ‘tapes’ he has in in his deck? Grand Funk Railroad? Fantastic art and arrangement here! Could this page be that much newer? Regarding the retelling of the movie with additional artwork, I say go for it! I love seeing SW through the eyes of a kid, and with all the Special Editions, Platinum & BluRay remixes, you could post either mixed with the pages you’ve already posted, or a whole separate feature (like the “deleted scenes” that Lucasfilm has never bothered to try restoring and integrating in the movies… Biggs!). Thanks for the kind words, Scot. This is from around 1982 or ’83, so it’s 4 or 5 years after I started adapting the film. I would LOVE to do a re-telling via all the other masses of artwork. 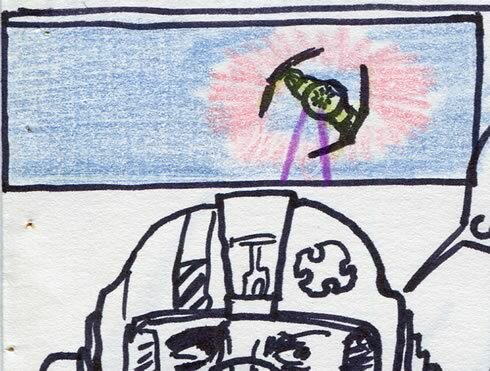 Funny you should mention Biggs, I don’t think he makes much of an appearance in the non-comic drawings. Have you seen this though? I’ve been lurking on-and-off since then (wow! has it been that long?!). I missed some stuff, so I’m re-reading from the compactor scenes. Just ran into your comic about “Aliens”; is there a lot of drawing for that one? I’m delighted you’re re-reading it Scott. Makes it even more worthwhile. Loads of pages in A L I E N ! But…I never finished it. Ripley’s just changing into the spacesuit in the locker and it just – stops. I’ll have to finish the story off with new pages. The Biggs and Luke one just LOOKED odd. I swear. If you don’t have the low angle shot of Ripley in the locker, there’ll be hell to pay. Oh you HAVE to do a new Star Wars one. It’s not just the drawings that are great but the commentary! I would actually have to quit my job and get divorced to take on a project like that! If I get rich from these comics – ha ha, yeah right – and no longer have to be a wage slave: I’LL DO IT.